Maarten Ten Holter at Vripack tells me that Chuck MacMahon of Northrop and Johnson has now been appointed joint central agent for the sale of Beothuk, a 31.11m motor yacht. Beothuk was built by Kuipers in 2008 as part of their Doggersbank Offshore series. A long range superyacht, capable of 4,000 nautical miles at 10 knots, she was the first yacht fitted with all-LED lighting. 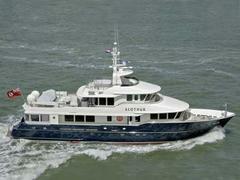 Accommodating six guests in a master, double and twin cabins, *Beothuk *is asking $15.9 million.